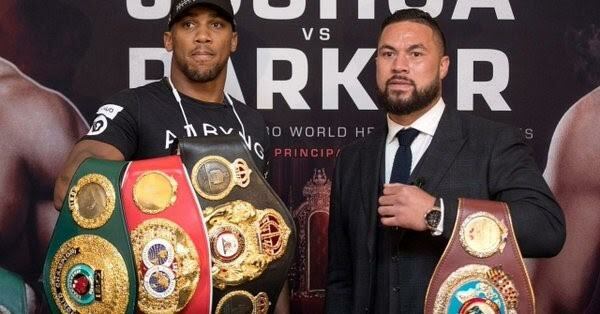 On the 31st of March two heavyweight world champions, Anthony Joshua and Joseph Parker, share the ring in a unification fight at the Principality Stadium, Cardiff. Joseph Parker, 26, is undefeated in 24 fights with 18 wins coming by way of knockout. He boasts an impressive knockout ratio of 75%. He is the current WBO heavyweight champion and has successfully defended his title two times since winning the title in 2016 against Andy Ruiz Jr.
Anthony Joshua, 28, is undefeated in 20 fights with 20 wins coming by way of knockout. He boasts an impressive knockout ratio of 100%. He is the current IBO, WBA and IBF champion. He picked up all three titles from Wladimir Klitschko in 2017 with an impressive victory. “It’s a Joshua win – Joshua has to take a little bit of caution because Parker’s tough, he’s never been floored. “Parker’s feet aren’t the fastest even though Joshua can’t move like Hughie Fury and you wouldn’t want him to move like that, or it would be a dreadful fight like it was with Fury-Parker. Joshua hasn’t got that fluency in his movement but he’s got better footwork than we give him credit for. He punches correctly, he has a neater style and I think he gets the stoppage. “I think Parker’s got to try and get close. If he doesn’t commit then he gets out boxed and gets stopped late. If he does commit he may get stopped early, it’s that sort of fight – I can’t see anything but a Joshua win. “Listen, it’s a crazy time because we got two youngish, especially for the heavyweight fighters who’re world champions who are still learning their trade. I don’t know if that’s a good thing for boxing or a bad thing that our world champions are still not seasoned enough, but they’re the best. Barry Jones gives fighters a chance of beating Anthony Joshua but he believes only one fighter has a real chance. “Of course I give fighters a chance. “Wilder, with his long arms and the way he commits with his punches – I think that’s the way to beat Joshua. Joshua can be hurt like any heavyweight, so I think that can happen. That would be a hell of an explosive fight. I fancy Joshua because he punches cleaner, neater and he can punch right on the centre of a gap. Wilder is a little bit wild with his punches. “Someone like Fury can school him. Joshua could knock Tyson Fury out, but Tyson Fury could touch him all day with his jab, frustrate him, spin on that front foot and land those combinations. Similar what he did to Klitschko, he could dance to an impressive win, if not exciting an impressive a clear win. “There’s ways to beat him. Parker has the power to earn Joshua’s respect and he can knock him out as well. I think Joshua is learning all the time. We’re looking at his last fight with Joshua and we’re saying Takam deserved to go the distance. And I think he got criticised for that but he was winning hands down, don’t forget that, and that’s impressive enough.